MeldaProduction has released v9.17 of its entire plugin range, introducing the new (and free) MOscilloscope. How come I never talked to you about the Sonic Visualiser? Well it’s just been updated to v2.4, so it’s now or never! 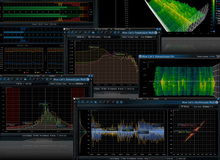 Automatl DSP debuts with EasySSP, a multitrack frequency analyzer in VST format for Windows 32 and 64-bit. Hofa has just updated its 4U ProjectTime analyzer to version 2.0, which is a good opportunity to highlight the 4U Series. We'll finish this Freeware Week with Specan32, a spectrum analyzer for Mac and Windows by russian PiTone. This week, we'll think practical with Plugin Update, the new Kazrog project for Mac and TraKmeter for tracking audio levels on PC and Linux. Toscanalyzer.org has released Toscanalyzer, a new audio-analysis tool for mixing, mastering and music-production.